We’re one month into the new year! While the team had some time off extending into January, we still managed to work and spike on authentication, migration from LB3, user adoption, extensibility, and documentation. Read more to find out how it all unfolded. This month our discussion focused on dividing the responsibilities among controller, repository and services/utilities. The controller function should extract credentials like email, username and password from the request. And calls the service to perform login. The service is injected via DI. 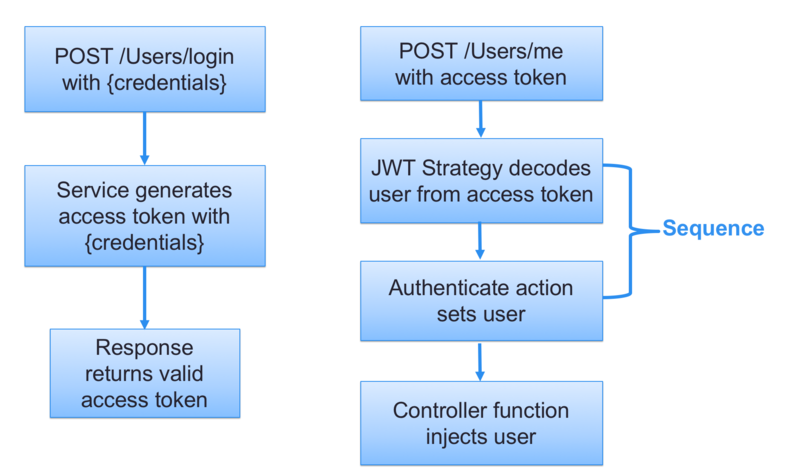 plugin Passport based strategies leveraging the existing auth action in @loopback/authentication. plugin non-passport based strategies like the JWT strategy created by us. a more flexible user profile type that allow people return custom properties. PR https://github.com/strongloop/loopback-next/pull/2249 illustrates extension point/extension pattern is in progress. It provides a standard to make extension point that the 3 above stories could follow. A more detailed tutorial will be created after finishing the story Refactor authentication util functions into a service. Also, in PR #795, Nora improved the UX for users on loopback.io by setting up redirects for the current LoopBack 4 website and LoopBack 3 in Active LTS, akin to how Node.js has the split for the different version downloads in their main landing page. We continue to refine our extensibility story as we build more extensions. Introduced BindingFilter to match multiple bindings using a function. Refactored code to use it for Context APIs such as find and findByTag. Exposed filterByKey and filterByTag utility functions. To make it easy to implement the extension point/extension pattern, we’re building up new features for @loopback/context. There are number of PRs under review. You are welcome to join our discussions in these pull requests. Please be aware that such PRs can be changed or abandoned during the review process. We’re always striving to have better documentation for our users. In PR#2214, Nora added much needed descriptions to our relation decorators page with clear examples on how they are applied. Moreover, Dominique wrote an excellent guide on how to publish a LoopBack 4 application to Kubernetes on IBM Cloud in PR#2160. Check it out here. In January, Miroslav implemented a proof of concept showing a compatibility layer that would allow application developers to take their model files (.json and .js) from an existing LB3 project and drop them mostly as-is to a LB4 application. The idea is to simplify the migration path from LB3 to LB4 by allowing developers to update their existing applications from LB3 to LB4 runtime (and dependencies) without having to rework their source code to the new programming model yet. The migrated models will run fully on LB4 runtime and thus enjoy longer LTS. If you have an LB3 application and considering upgrading to LB4, then please join the discussion in PR#2274. Your feedback is very important to us! While waiting for more feedback from our users, Miroslav reviewed early input and started to look into ways to mount an entire LB3 application inside an LB4 project. While such solution still depends on LB3 runtime that will eventually go out of support, it will provide almost 100% backwards compatibility and require very little code changes. Let us know if this option would be useful for your project and leave a comment in [PR#2318]strongloop/loopback-next#2318). The LoopBack team hosted a meetup in downtown Toronto on February 5th, 2019. We taught users all about LoopBack 4 and demonstrated the capabilities and integrations of the framework. We worked hard to prepare presentations and demos for the meetup during this month. If you are in the Toronto area and are interested in future meetups, check out the Toronto Cloud Integration Meetup Group and make sure to sign up! February is an event-filled month. Besides the meetup in Toronto, there will be LoopBack coverage at Code @ Think in Node.js Master Class and as one of the Quick Labs. Raymond will be presenting at DeveloperWeek on Feb 21 on the topic – Speed and Scale: Building APIs with Node.js, TypeScript and LoopBack. Twitter is a great way to stay in the loop with StrongLoop and LoopBack news. The best way to learn about events we are part of is generally https://strongloop.com/events/. We’d like to introduce our new LoopBack development team member Dominique at our Markham lab. Dominique brings lots of experience and knowledge from working in Message Broker and App Connect development team in the past. He has already given us a step-by-step tutorial on how to deploy a LoopBack 4 application to Kubernetes in IBM Cloud here. Welcome, Dominique!